Just brought this 1980's bathroom into the 21st century! Just brought this 1980's bathroom into the 21st century! I wish you could meet my Aunt. She is awesome. She lives in a home that has great bones, but needs updating. Her master bathroom had a major case of 1982, but more importantly it wasn’t usable. As in, they couldn’t even take a shower in there. But like so many people they didn’t have time to take on a major renovation and she will be the first to admit that when it comes to planning a remodel or decorating a space, she doesn’t even know where to start. So procrastination took over and soon her bathtub had turned into a catch all. A far cry from the updated clean oasis that she had in mind. Like I said, my aunt is awesome. So when she came to me and my mom to help her finally get her bathroom done once and for all, we were excited! She had finally had enough of not being able to use her bathroom, not to mention the wallpaper, the poor lighting, and the not so functional vanity area. This is what she has lived with for over 15 years. The vanity is far too low, there is only one vanity mirror, and although there is a ton of natural light that doesn’t help you when you are getting ready before the sun comes up! Like I said, this house has great bones, and this master bathroom is huge! 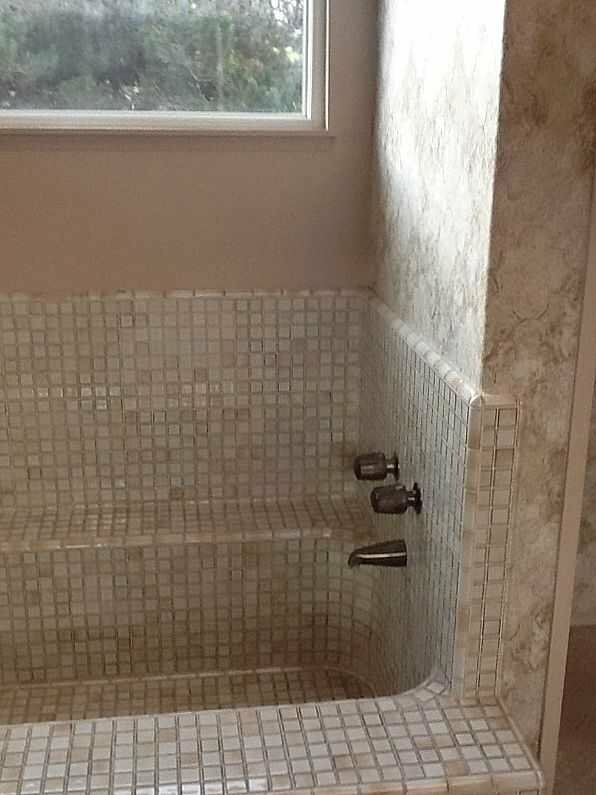 But this mosaic tub wasn’t even usable because somewhere in the walls there was a leak. The separate shower stall wasn’t usable either because of the same leak. All that mosaic tile coupled with the pinky beige walls and the wallpaper to match had to go! Here’s a peek of the wallpaper that was all the way up to the vaulted ceiling on some walls! So we met with her to get a good idea of what she wanted. We showed up with inspiration photos, tile and wood samples, and paint samples to get us headed in the right direction. The plan was obviously to hire someone to do the work, my mom would be in charge of communicating with the contractor and keeping tabs on the progress and together my mom and I came up with the design and options to present to my aunt in order to make the entire process way less overwhelming. 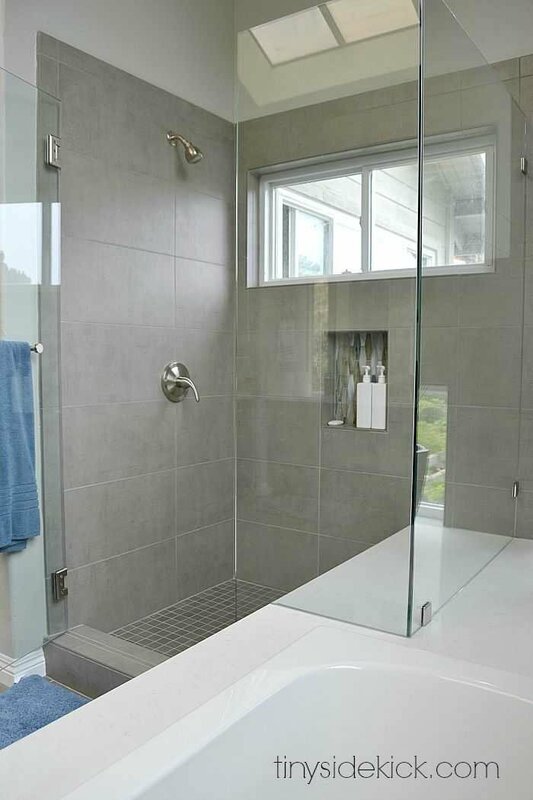 She wanted her master bathroom to have clean lines, but not be too modern. She also loves a little bit of a coastal touch, since she lives near the coast. What a huge difference eh? I really can’t believe it. I mean cummon! It is an entirely new space! 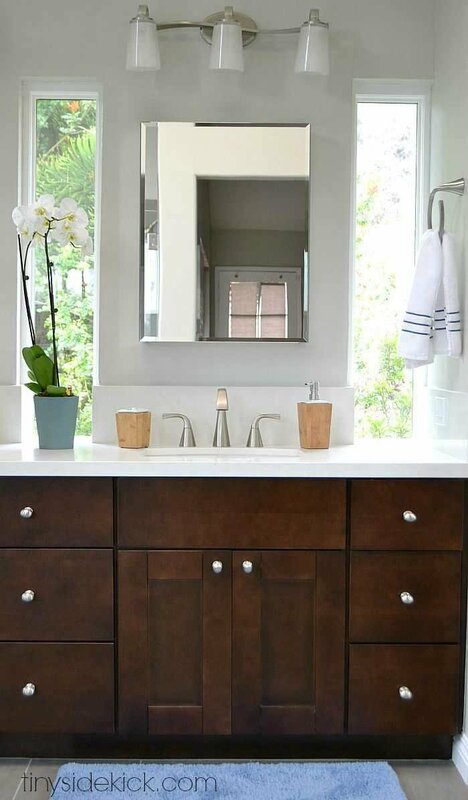 We raised the vanity about 4 inches to make it more modern and more comfortable. The new vanity has much more storage with 3 banks of drawers and 2 cupboards. The new undermount sinks were moved slightly to be centered. New Moen faucets were installed. We also got rid of the medicine cabinets on either side wall and instead made the mirrors above each sink a medicine cabinet for lots of extra storage. 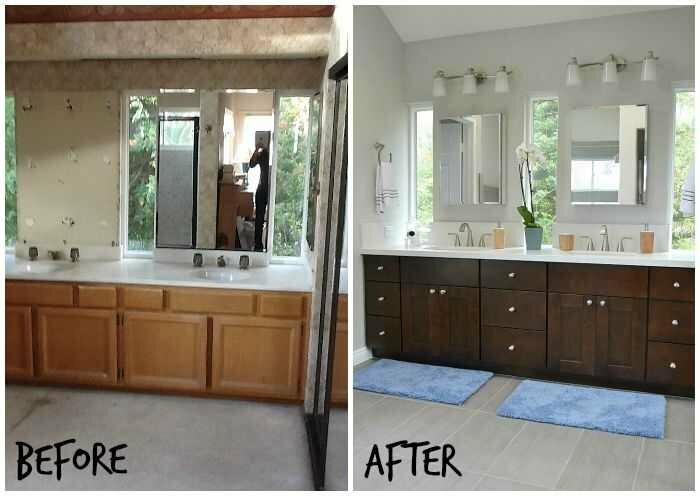 The bulk head over the vanity was removed to showcase the vaulted ceilings and new vanity lights were placed above each sink on the wall. The tub area was completely gutted and redone. The quarts (Ceasarsone in Minsy Carrera) used on the vanity was also used in this space as the top of the tub and extended into the corner and into the shower as the bench top. I love how this created a really seamless transition to bring what used to be a really awkward space together. A new tub was put in place and the new tub faucet now comes out of the top of the tub rather than out of the wall. This will make it much easier to fix, if there is ever another issue. 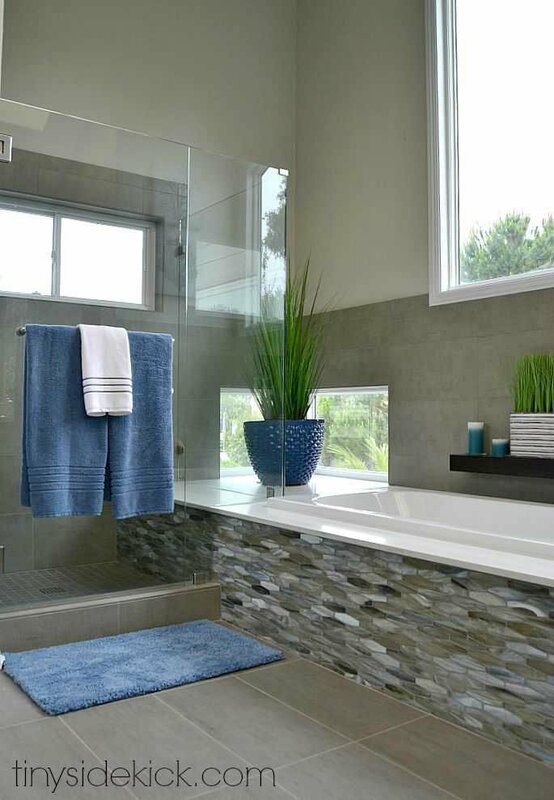 The show stopper of this bathroom is definitely the mosaic tile on the front of the tub. It is called Vihara KIRI Silk. We purchases through out local speciality tile shop, but you can find it online here. 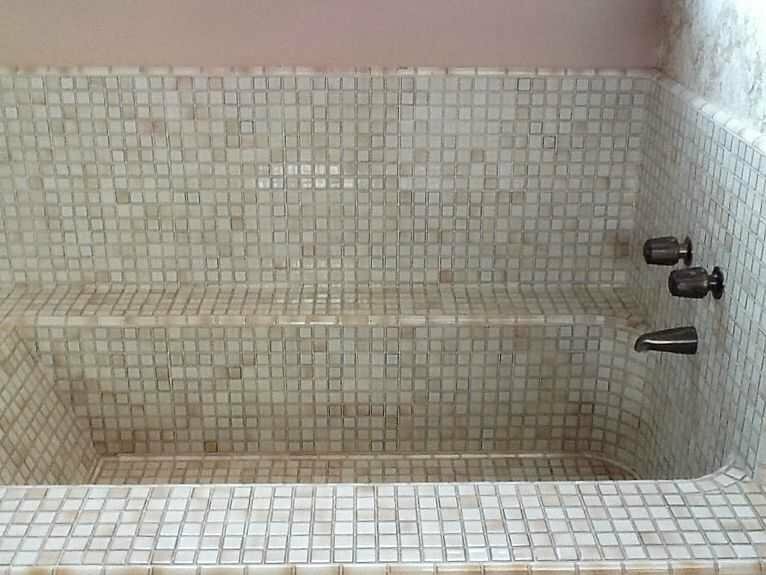 In the shower, we made the bench straight and carried the mosaic tile right on through. For the shower floor the bathroom floor tiles were used in a 2×2 to make it not so slippery. 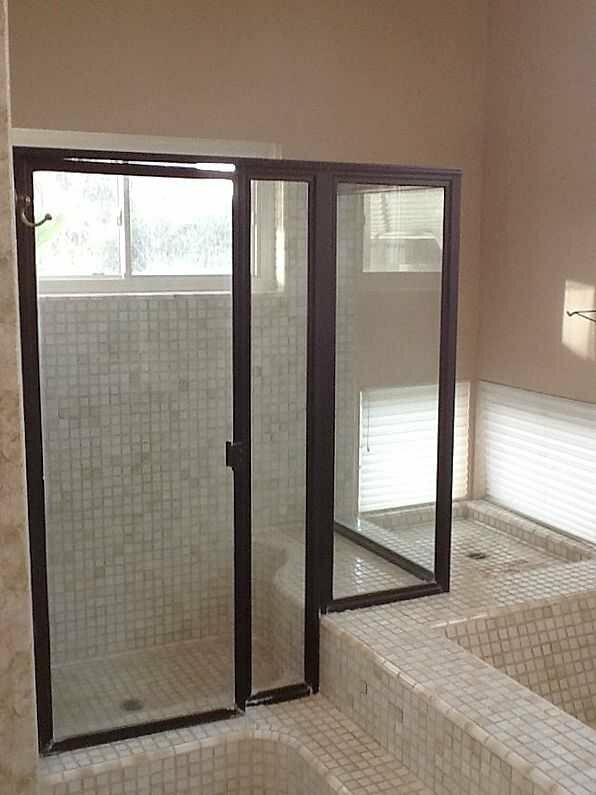 The dated framed glass was removed and replaced with a frameless glass enclosure. The awkward corner was something we thought a lot about but in the end we decided just to flatten it out, carry the quarts through, and place a large indoor plant there. 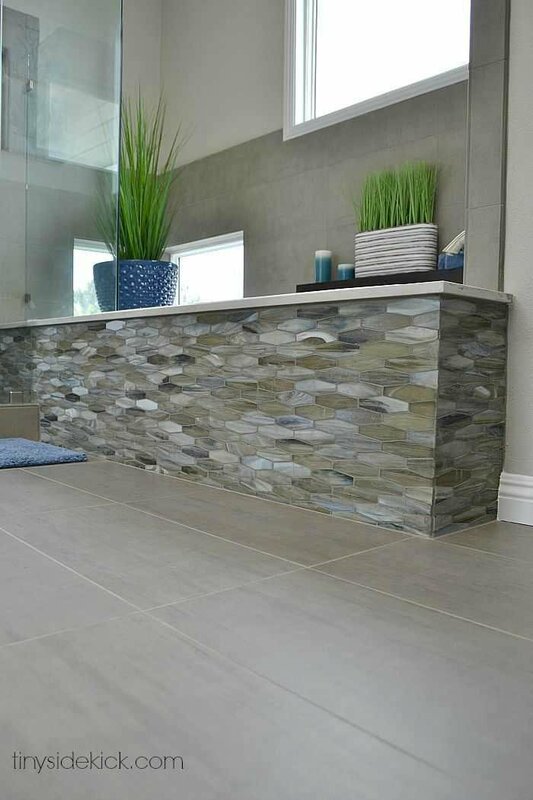 The floor tile is also a 12 x 18 large scale tile in a slightly darker color than the wall tile. It is called Contempo Dark Grey and we purchased it at a local tile shop, but I found it online here. The wall color is Repose Grey by Sherwin Williams, one of my favorite go to greige colors. This bathroom was something that my aunt had put off for sooooo long. It was really important to my mom and I that we involve her in the process without overwhelming her, and also to push her in the right direction just a little bit. We are thrilled with the result and love that she loves the outcome. I asked her for one tidbit of advice for those of you getting ready to hire someone to remodel your space and here is what she said. Love this advice. It will save you so many headaches cause those little decisions will be made for you if you don’t say something before hand. 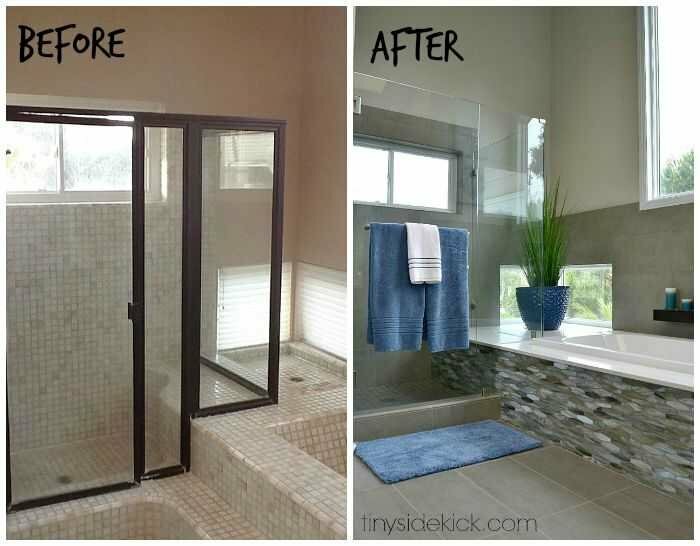 If you loved this transformation, be sure to pin the image below! Want more bathroom inspiration? 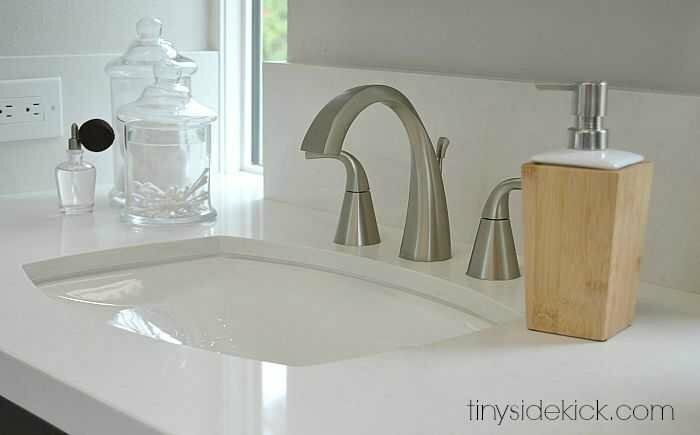 Be sure to check out our kid’s bathroom reveal! 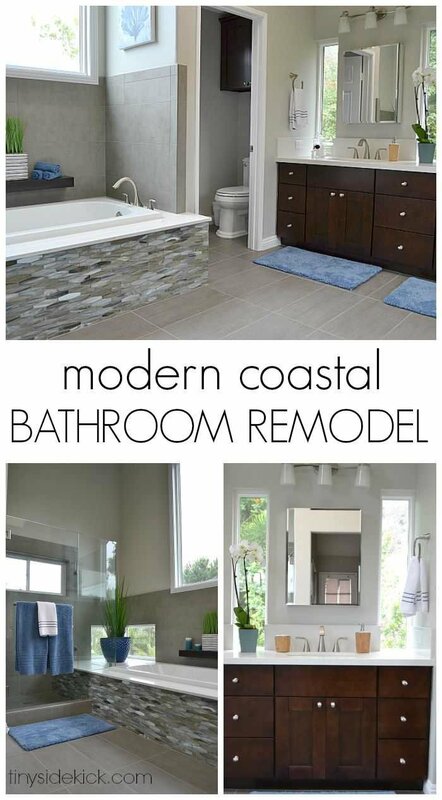 This bathroom remodel is just beautiful. Thanks Vickie, I appreciate your feedback! Hi Joanna! You’re so welcome! Don’t ya just love that vanity?! It was custom made by a local guy so it can’t be purchased retail. 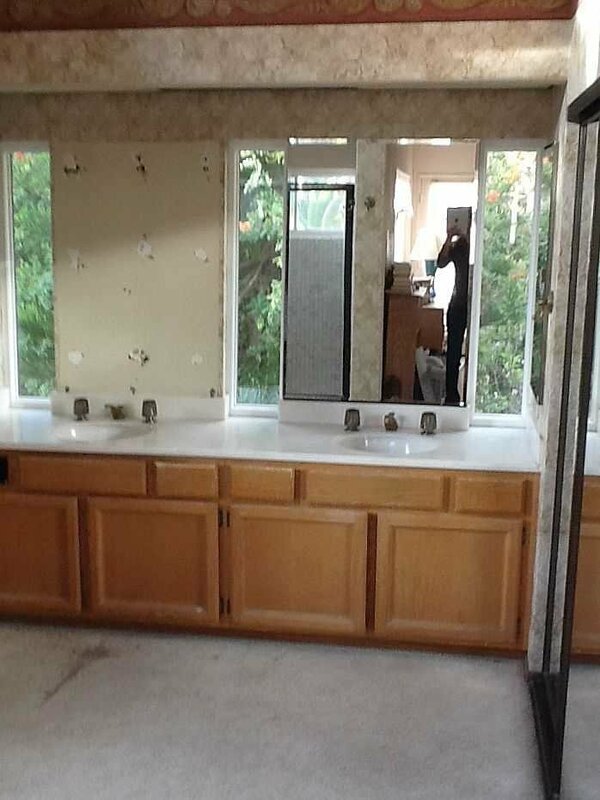 Do you have information on total cost of remodel?.Thanks . Hey Shirley! 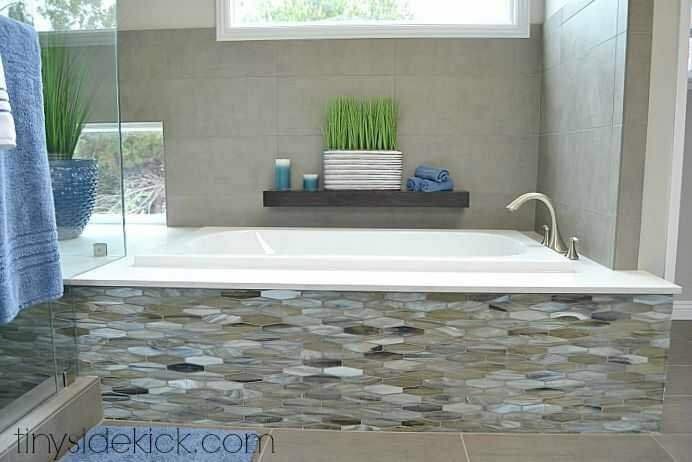 I think we spent about 4K but a lot will depend on the tile you choose and if you can do most of the work yourself or have to hire out. Thanks for stopping by! I LOVE this. I have been overwhelmed with our bathroom as well. I think you just made it easier for me! Good job! Transformation is fantastic…bathroom now has the aahhhh feeling! Thank you so much Tammara. THIS IS ABSOLUTELY BEAUTIFUL!!!!!!!!!!!!!!!!!!!! (All caps and a million exclamation points does not even begin t express how much I love this and how envious I am right now!) Great job ladies! Wow. You didn’t update it, you gave it an entire new life. It looks amazing! True. It was a total gut job that was long overdue and we had so much fun! This bathroom is AMAZING! It’s seriously magazine-worthy. I love everything about it. 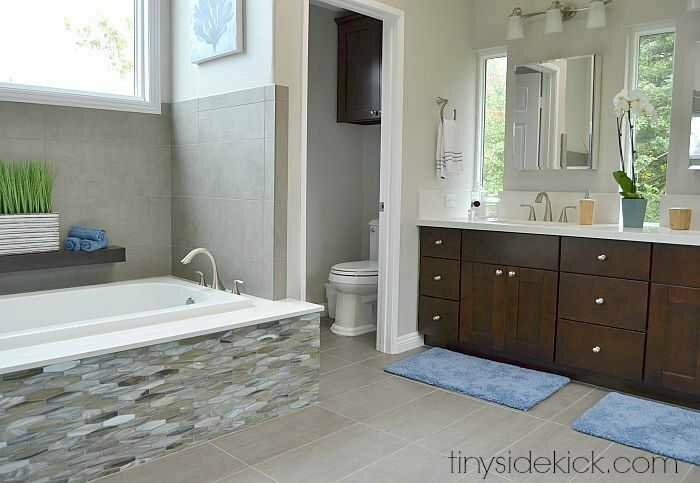 The tile on the outside of the tub is so pretty and the perfect contrast to the rest of the tile. Great job! Wow! What an amazing transformation, Corey! Looks great! Such a great transformation! I LOVE how it turned out!!! Thanks Jill! I hope you and Rob are doing well! I was SO excited to see this. 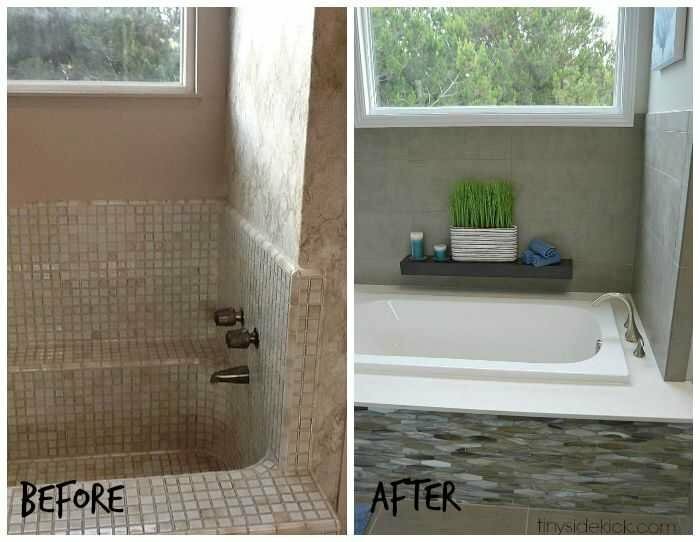 My master bath is similar to this one (tub adjoining the shower, vaulted ceilings, etc..) and I have wanted to do something similar with the accent tile on the tub face. My husband is not skilled at visualizing this kind of thing and has asked for examples so he can better understand how it will look. Believe me, I had looked on sites like Houzz and on Pinterest for good examples, but nothing was quite right. You saved me! My hubs has a hard time envisioning what is in my head too. Glad I could help with the visual! OH MY GOSH! Corey you and your mom did an incredible job! I am always blown away with your talent and eye for design. I’m sure your aunt is over the moon about her new bathroom because it’s gorgeous! Thanks buddy! It was so much fun! Thank you so much. I love the colors too. So much natural with a mix of modern. Ah shucks. Thanks Kirsten 🙂 She is definitely happy, which makes me happy.